Overloaded with vegetables, herbs, and chickens, or just thinking about next year? Whatever your motivation, bringing produce and food to sell at the farmer's market is a cornerstone of many small farms' marketing plans. 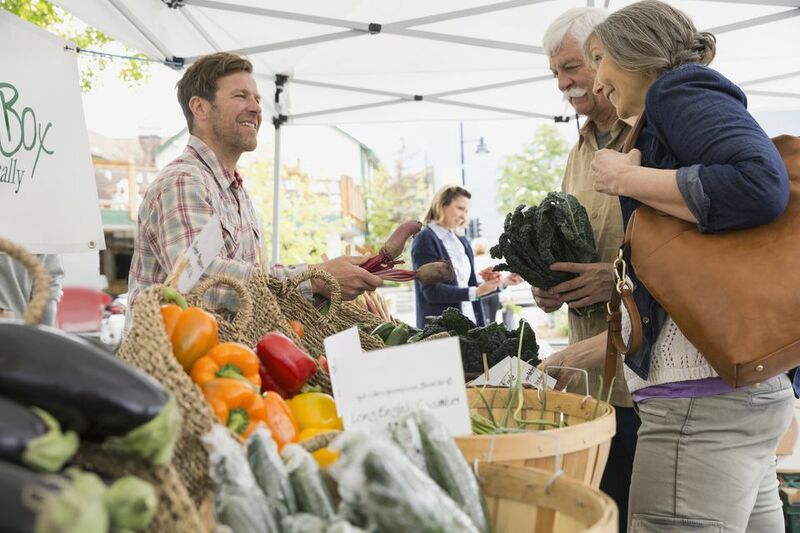 Before you pack up the van or truck, learn how to maximize profits and minimize undue effort when you sell at the farmers market. Let's face it. Everyone has piles of zucchini, heads of romaine, and cucumbers. What are you going to offer that's different or unique? Is it a specialty lettuce, an heirloom tomato, or an uncommon herb? Think outside the supermarket. What can you offer customers that the supermarket or even the local food co-op cannot? Some of the unique things we've seen recently: sprouts and shoots, micro greens, rare lettuces, rare or uncommon herbs like marjoram, and value-added products like elderberry syrup, dried herbs, and bags of mixed roots with instructions/ideas for cooking them. Potential customers go gaga over information. Clearly labeled prices are a good starting point. But go above and beyond. Make signs that answer your customers' common questions. Put information about your growing practices on cards for people to look at. Do your laying hens have names? Make a sign proclaiming, "Henrietta lays the yummiest eggs!" Get creative, think eye-catching. Is it organic, free-range, pastured, integrated pest management? Name the quality, then describe what it means to the customer. Is it a specialty, heirloom, or rare? Maybe a sign explaining that Roy's Calais Flint Corn is a rare, heirloom variety common in New England in the 19th century will spark someone's interest. How do you use it? What is it good with? You might share that your kale is particularly tender and that the baby leaves can be eaten raw in a salad, for example. Selling a unique or uncommon herb? Suggest pairings with other herbs and with foods. Bring photos of your farm, and print off your "About Us" page from your website and have it available for customers to read. While you're at it, it's a good idea to have business cards with your farm's name, location, hours, and website available. Brochures on CSA shares, copies of any newspaper or magazine articles featuring your farm -- think of anything and everything that showcases who you are and what you do and bring it for customers to look at. Laminating signs keeps them free of water droplets and will help them last longer. Print recipes for the products you sell, especially if they're common or you have them in huge quantity. If customers can go home with a recipe for cucumber pickles, they're more likely to buy an entire box instead of just a few pounds. If they know they can freeze shredded zucchini, they might buy more of it. Remind them how good fresh zucchini bread can taste in November! Tell them how to dry herbs effectively, or how to make them into herb pastes and pestos. Customers are much more likely to come over to your table if you have some plates of attractively-presented samples for them to munch on. Plus, it gives them a chance to try something they might not have before. "What's a lemon cucumber? Here, have a bite! What do you think?" Now you have a conversation going. To make money farming, you need to keep careful records of what it costs you to produce each food. Make sure you're covering costs and making a profit. Keep records of what sells and for what price, and use creative pricing strategies to sell more. Charge what it's worth - undercharging doesn't help anybody and won't earn you friends. At the same time, you should have a variety of products at different price points, from less expensive to higher-end and in between. Your price may vary from week to week or throughout the season for the same item -- that's okay, just be sure your signs are consistent and reflect the changes. Keep your supplies and signs organized and neat so that setup on market day is efficient and fast. Also, if you're hiring workers to help sell or to take everything to market, it will only help to have things well-organized. How Do You Build Your Own Portable Chicken Coop? What Is Biodynamic Farming and How Can You Use It?